Well, that was an epic day. 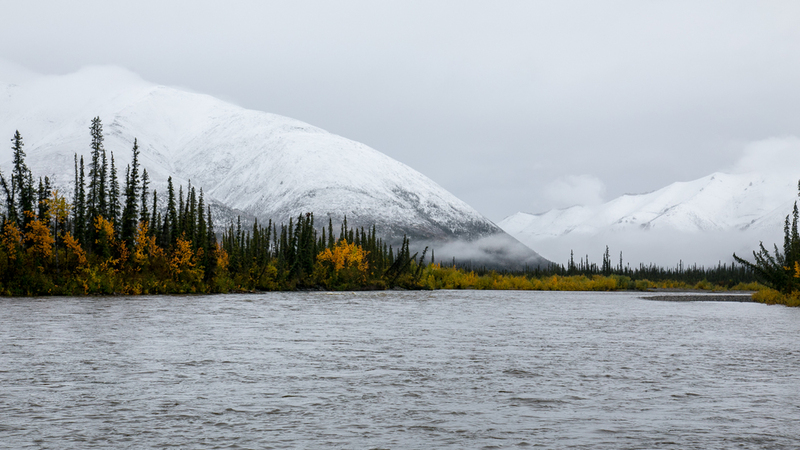 Our plan was to drive the Dempster to the Arctic Circle. The original plan told us it would take about 6 hours each way, making for at least a 12 hour day. As it turned out, that was an optimistic estimate. 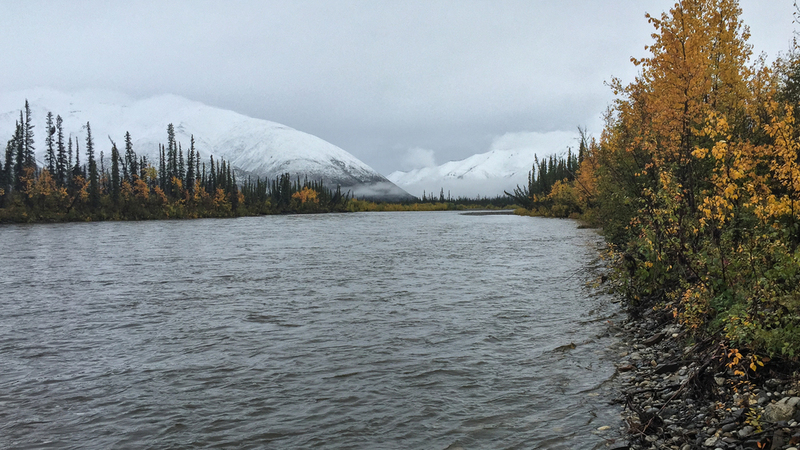 The weather on the days proceeding our trip had been ... wintery, and we had heard that they had received upwards of six inches of snow on the Dempster, up near Eagle Plains. We decided to head out anyway, as we could turn around if things looked bad. The conditions were wintery as we headed out. We had received some snow overnight, even at these lower elevations. As Dad and Dave have both been driving a lot, I offered to drive. We had woken up to more snow falling, and sadly low visibility. The road conditions for the first part of the trip were pretty good, for about the first 150 km. Sadly, there wasn't a lot to see during that stretch. We haven't been having a lot of luck with wildlife. The light wasn't very nice as the trip began, but there was still a lot of colour. As we headed north, the landscapes were pretty amazing. What was strange was that the terrain didn't really change much. 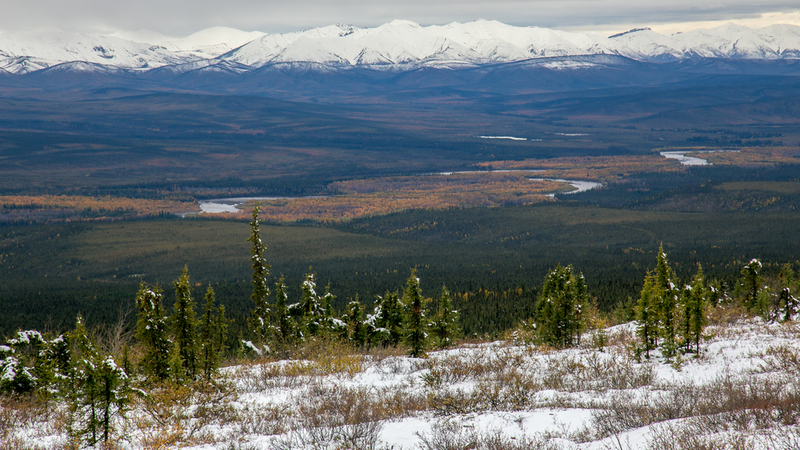 We had lots of colour on the tundra for the first hour or two (I don't remember a lot - I was really having to concentrate on the road), but then it seemed to switch back to the forests we've seen on most of the trip. I guess I was expecting that we would be above the tree-line, but I guess not. 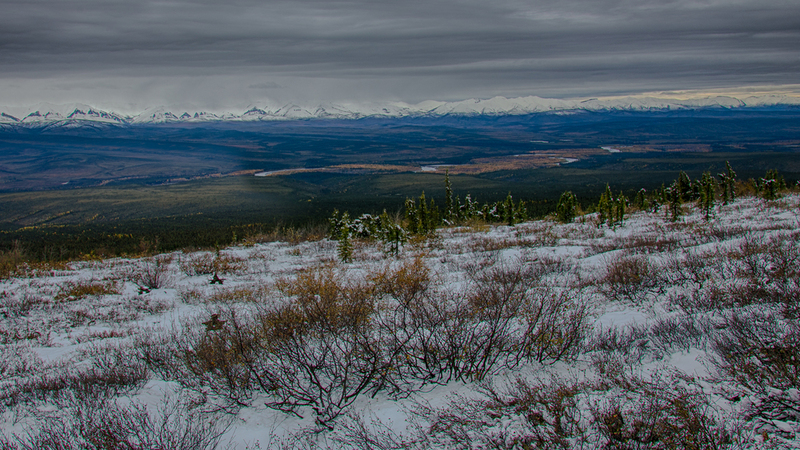 A bit of snow on the tundra. There were small lakes dotting the tundra during the first hour of the drive. Then the road conditions went to hell. The visibility dropped significantly, and our average speed dropped to about 30 km/h, as the road turned into a rutted, sloppy mess. It was a bit of a nightmare. We had a total trip of 330 km to the Arctic Circle, with a stop at about 300 km for gas at Eagle Plains. Needless to say, it was taking all of my efforts to concentrate on the driving. The worst was the trucks. There were quite a few of them, and they were flying up and down the road like the conditions were perfect. We didn't see a lot of them on the way up, but on the way back they were a nightmare. This gives you a pretty good idea of what the roads were like. OK not really - thye were way worse than they look. Japanese dude walking the Dempster. The strangest sight of the whole trip was on this stretch of highway - a Japanese guy was walking the Dempster, pulling a cart (we assume with all his gear in it.) I have no idea why he was doing it, but I can't even begin to imagine how hard that would be. We left at 7:00 am, and it took us until 1:30 to get to Eagle Plains where we stopped for gas and lunch. The conditions had deteriorated to their worst point, so I really needed to stop and the lunch break was welcomed. Dad's truck was a bit of a mess when we got to Eagle Plains. We all needed a break from the road at this point. Lunch time! Eagle Plains is an interesting place. 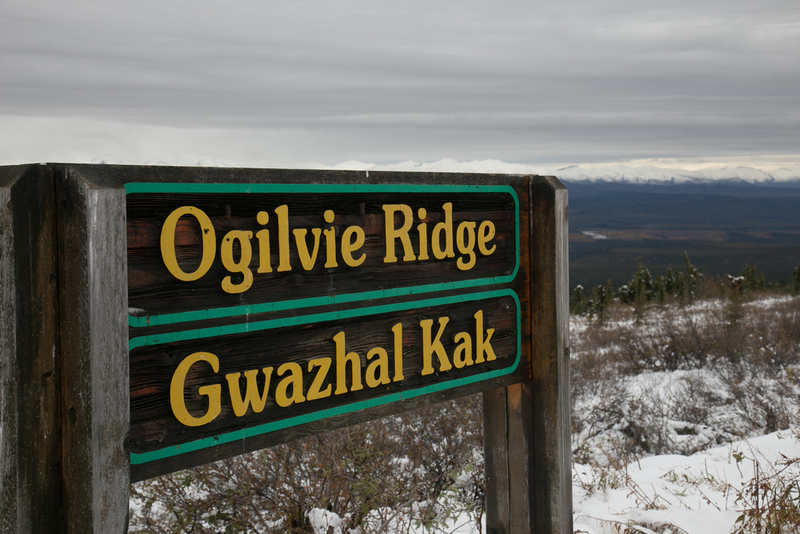 A small outpost halfway between Dawson City and Inuvik, there's nothing for 400 km in either direction. There's not much to say - it's exactly what you'd expect. The food was fine, we got gassed up and did the last 35 km to the Arctic Circle. It was a bit anticlimactic once we got there - a signpost in the snow. We stopped for about 15 minutes, took some pictures and had a champaign toast to arriving at the Arctic Circle. We made it to the Arctic Circle! Justine checking out the sign. A toast at the Arctic Circle. One of the stops we made on the way home. The views seemed to go on forever. Then it was time to make the return drive back to camp - I was not looking forward to it. The first couple of hundred kms were brutal, but not seemed like the weather was improving. It was starting to brighten a bit, and you could see much better. The roads were still a mess. The road was still a mess, but we could see some of the amazing scenery. It was spectacular. About half way home dad yelled "wolf" and we were treated to an incredible sighting. Not far off the side of the road was a lone grey wolf. He was off a ways in the snow, and we got to watch him work his way along the side of the road. It was incredible to see. My best shot of the wolf. Working his way through the snow. The scenery continued to get better as we headed south. 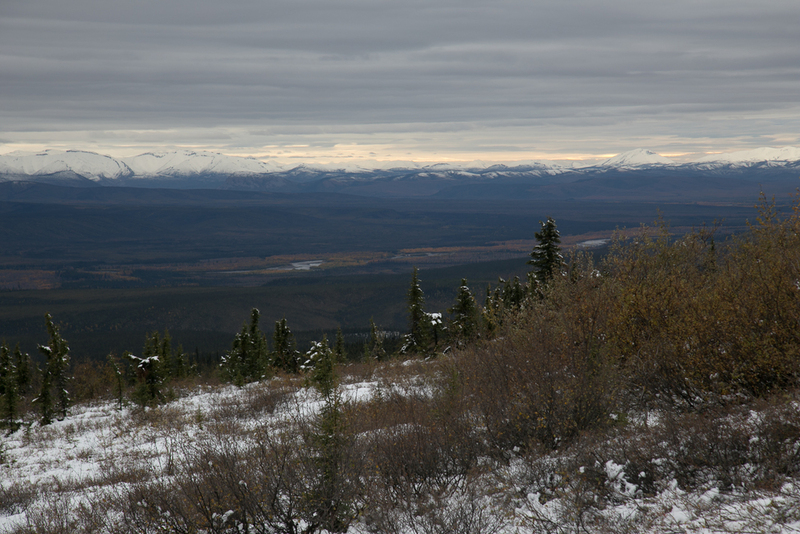 One of the things that surprised me was that all the way to the Arctic Circle, there were lots of trees. 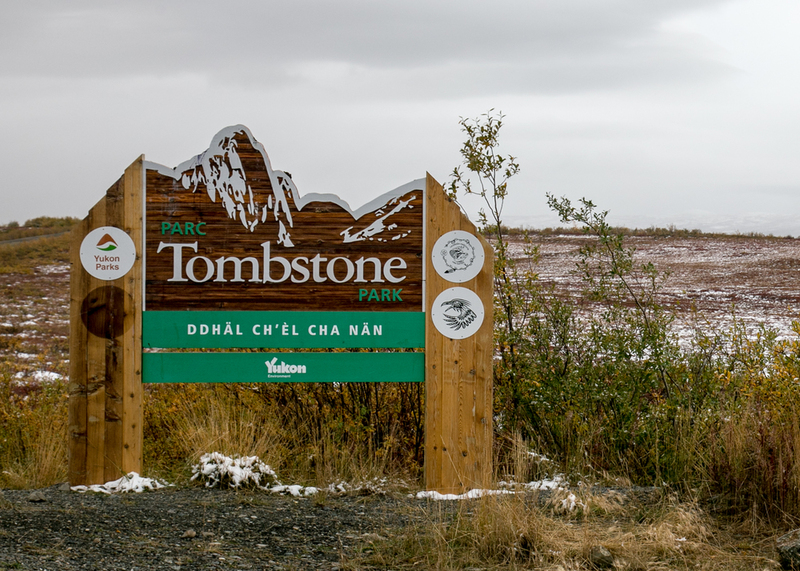 I had assumed we'd be above the tree line, and the area around Tombstone campground gave me more of the look of the tundra than most of the drive further north. The weather started to clear up a bit as we headed south. About an hour after the wolf sighting, Dave spotted a black bear sitting on the side of the road, in the midst of all the bright red birch bushes. He was pretty big, and looked well fed. Very glossy. He was content to sit and eat, and wasn't too worried about us. He was pretty intent on getting at lunch. We finally got a look at his face. The colour was amazing, as the weather got a bit better. Back to our lakes closer to the campground. As we got closer to the campground, the weather improved, but as it was getting late in the day, the light was disappearing. 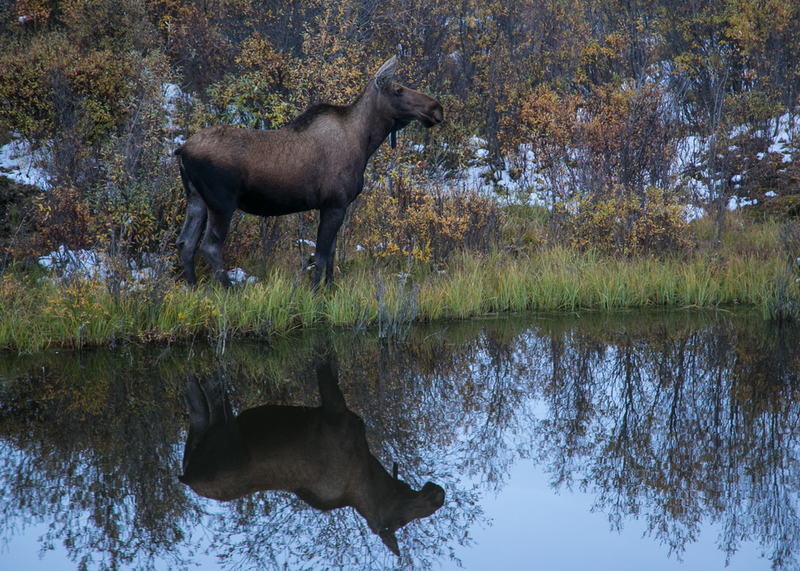 About 30 km North of the campsite, we had our last wildlife encounter - a female moose and her calf, in a pond at the side of the road. 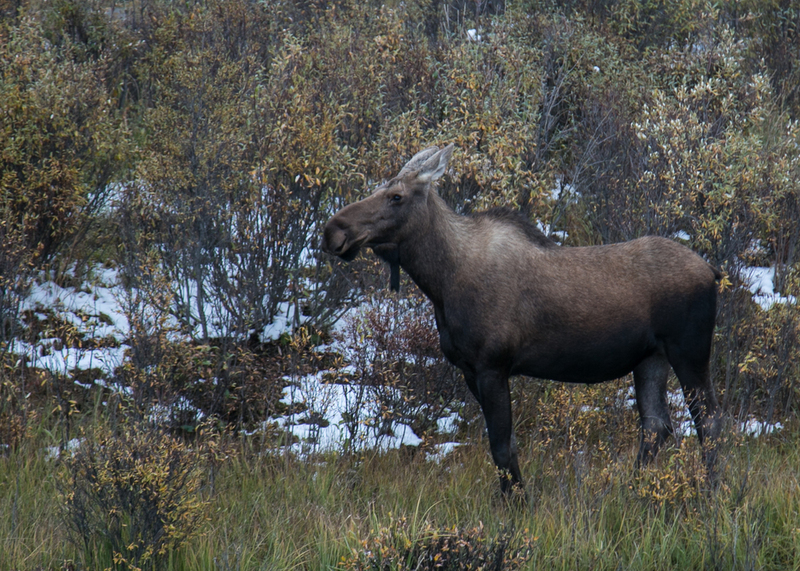 Our female moose, checking up on her calf which we really didn't get a good look at. She really wasn't too worried about us, and stuck her head all the way under the water to feed. We didn't see a lot of the calf - mom chased it deeper into the trees - be we had a great view of her, as she fed in the little pond. It was very cool. After a while we left her in peace and headed back to the campsite. It was about 10:00 by the time we got back - a 15 hour day. While it was brutal at times, it was also very rewarding and we had some amazing encounters. Dad's truck was a disaster by the time we got back to the campground, after a full day on the Dempster Highway.